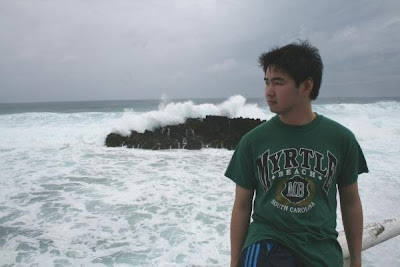 It was 3 weeks before the start of my classes, I miss the waves and fine sands of the beach and I haven’t gone to the beach this summer. My old true friends and I were always seeing each other, catching up to those moments we didn’t spend together. So a week before our travel, I decided to invite my friends to go to Bolinao, Pangasinan because I haven’t been there yet, although it’s just 2 hours away from us, My family never went there. So they agreed and I volunteered to cook and bring the food, as well as to pay the gas for our trip. An unexpected thing happen, PAGASA announced that there is a typhoon coming to northern Luzon and it’s really strong and Pangasinan is signal # 2, it was the night before our trip. My grandfather warned me that we should not go and postponed our vacation to the beach. But I said PAGASA always announces the wrong weather forecast because there tools were already obsolete that’s why it’s inaccurate. So my friends and I still insisted to go to Bolinao. 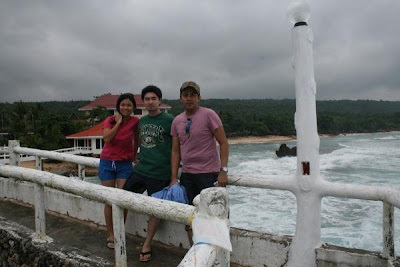 We left on May 20, 2008 at 4 in the morning and we arrived at bolinao at 6 in the morning. The wind and rain was still weak. We went to the famous Puerto Del Sol Resort and just checked how beautiful the resort was. Although we can’t bring in food, so we have to find another resort as equally as beautiful and as popular as Puerto Del Sol, We found Treasures of Bolinao Resort where the movie Agent X44 was shot. This resort was at the edge of the Philippines overlooking South China Sea where you can see giant dead rocks and strong waves splashing into it. So we stayed and enjoyed there, We swam in the pool and in the creamy white sand beach despite the waves being big. We sang in the videoke. We ate a lot of food that I cooked. So it was 3 in the afternoon and we were preparing to leave because the wind was already getting strong, it was black out and we were soaking wet because of the strong rain. We didn’t know that the signal of Typhoon Halong was raised to #3 already. Our gas was already near empty because we forgot to go to the gas station because of too much excitement going to the beach. We were already at Alaminos, Pangasinan when suddenly there is a detour sign because a post fell down and destroyed the big Jollibee sign. So we were confused with the way and we ended up going to Burgos Poblacion which is a separate road going to Zambales. We got stranded in Burgos because we encountered a real live tornado, the wind was turning white and forming a circle on us, all of the trees around us are falling down, and the car was really literally shaking. I got so excited while my friends were already so afraid. For me, that kind of situation was really what you can call Adventure!!! So we stopped for a while because the driver can’t see anything. Then we saw this gasoline station so we went there to wait for the typhoon to calm down. There was this kind hearted family who owned the Petron gas station who welcomed us 4 strangers inside their home. Her name was SUSAN GUIANG, our “ANGEL AMIDST ADVERSITY”. There was flood inside their house so we helped them removed the water as an exchange for their gratitude. We stayed there for 3 hours until the wind slowed down. Then we attempted again to go home because it was already late, we should be home at this time, there was no signal in networks as well as landline phones, it’s what I call “TOTAL BLACKOUT”. Our families were already worrying about us. So as we were driving, trying to find a way home, we were passing to almost all fallen big trees and electric posts and we can’t find a way to clear the road because we don’t have any tools to use. Good thing, the local authority were the ones to help us empty the road. So we were back to Alaminos and this time we really made sure we went to the right way. So we were happy when we were already at Labrador, Pangasinan, the next town after Alaminos. As we were driving, we saw a lot of stopover vehicles and all of them were switched off. So we were wondering why??? So I volunteered to step out of the car and ask what is happening. The wind and rain was so strong that I got so wet. The local authority told me that a big post fell down at the middle of the street and it will take them the whole night to remove the post because they lack big tools to cut and lift it. So we still tried to wait it out, we ate the food that I cooked inside the car because there was no electricity, all restaurants and hotel were closed. Good thing I cooked a lot of food or we would really starve. After an hour the police told us to head back to Alaminos for our safety because there’s no chance that we could get home until the next day. So we felt sad and drove back. We parked outside Nepo mall and just waited for the sun to rise. I tried to sleep but I can’t because a lot of mosquitos are biting me and it’s very warm and I can’t breathe because the engine was turned off and we can’t open the window because it’s raining strong. For 6 hours we waited and waited. It was 7 in the morning, my friends David and Rachel went out to find a cheap hotel just for us to stay and sleep because you can’t drive when your tired. So while Cris and I were sleeping at the back of the car, we suddenly woke up because we crashed to the mini bus just 10 feet in front of us. They also stayed there for the night. So we were frightened and wondering why did it happened. Then we realized that the driver David forgot to pull the handbreak. So he paid 2,000 pesos and was really pissed off because his bumper was also destroyed. We were quiet because he was not in the mood and we went to the hotel that they found. We slept for 7 hours. So it’s already 2 pm, after eating at chowking, we already drove back home. As we were driving in Lingayen, something caught our attention, it was mountains of Bangus. We stopped and tried to buy because the price went down at 30 pesos per kilo. They had to sell all the fishes because there was no electricity and no ice or refrigerator to preserve it, it will be rotten the next day. So I bought 3 kilos of Big Bangus. As we were passing by each town, we saw how typhoon Halong destroyed every tree, house and post especially mango trees. We really felt sad because millions of properties were crushed by Halong. And then it came to my realization that this is all our fault. Wow., You've been through all that??? Frightening!!! Hope this blog will serve as an inspiration to people to protect our beloved planet. I like your pic, perfect shot!